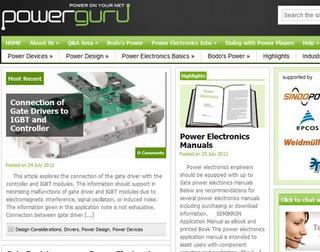 The new power electronics portal PowerGuru (www.powerguru.org) is branching out: following the launch of PowerGuru in May, the portal provider has now entered into cooperation with the power electronics journal Bodo’s Power Systems. As part of the cooperation, which began in June, past and future magazine articles will now be published online on the PowerGuru site. A publications area containing all the articles and papers from Bodo’s Power Systems magazine “Beside the expert papers and articles, the careers section is always in the focus of the readers,” comments Mr. Dahl. PowerGuru (www.powerguru.org) is a joint communications platform provided by LEM, Mersen, Proton-Electrotex, SEMIKRON, Sindopower, TDK Epcos, and Weidmüller. The website focuses on the needs of engineers working in the power electronics field. Currently PowerGuru is based on texts about partner products such as IGBTs, thyristors, diodes, sensors, capacitors, varistors, terminals and fuses, texts on design, and texts on the fundamentals of power electronics. Further articles on the applications of bridge rectifiers, induction, industrial drivers, lifts, UPS automotive, or on the use of power electronics components in solar plants and wind parks will be added in the future. All articles published on the site will also be archived. In addition, press releases on products and general information about power electronics companies will also be published. SEMIKRON is a leading global power semiconductor manufacturer. The German-based family enterprise employs 3900 people worldwide. A global network of 36 companies with production plants in Brazil, China, France, Germany, India, Italy, Korea, Slovakia, South Africa and USA guarantees fast and competent on-site customer care. SEMIKRON is a one-stop provider of chips, discrete semiconductors, transistor, diode and thyristor power modules, power assemblies and systems for markets such as industrial drives, wind and solar, hybrid and electric vehicles, the rail industry and power supply systems. SEMIKRON is the market leader in the field of diode/thyristor semiconductor modules, enjoying a 30% share of the worldwide market. (Source: IMS Research, The World Market for Power Semiconductor Discretes & Modules – 2011 Edition). Our dedication to the hybrid and electric vehicle market is evident in the development and production of power semiconductors for this market, as well as in the majority take-over of Compact Dynamics GmbH, a development specialist for innovative control systems, the joint venture with drivetek, a provider for application-specific control technology, and the take-over of VePOINT, developing and producing inverters, DC/DC converters and chargers. Recently, SEMIKRON introduced a revolutionary packaging technology for power semiconductors which does away with bond wires, solders and thermal paste. The new SKiN Technology is based on the use of a flexible foil and sintered connections rather than bond wires, solders and thermal paste. This results in a higher current carrying capacity and 10 times the load cycle capability – unthinkable with the restrictive wire bonding used in power electronics in the past. This enables a reduction in converter volume by 35%. This reliable and space-saving technology is the optimum solution for vehicle and wind power applications.